Home > Food marketing > Is Your Marketing Having Any Impact? WHICH OF YOUR MARKETING TACTICS HAVE IMPACT? Marketing can feel very squishy. How do you know which of your marketing tactics are having an impact? Many business owners prefer to focus on the more tangible operations…making sure the tomatoes are harvested, the greens are washed and packaged, and the farmers market stall is set up on time. But if you’re in business, you must constantly remind your customers that you have a product or service to sell. While I confess that I can’t always see the precise impact of each tactic I use, I KNOW that if I don’t do any marketing, there will be NO impact, because I won’t have any clients! Here are a couple of ways I’ve been tracking my marketing efforts. 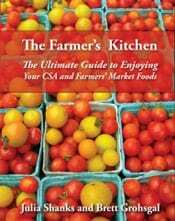 I just rereleased my cookbook, The Farmer’s Kitchen, so of course I want to generate new buzz and sales. When I promoted the book on my Facebook and Twitter pages, I provided a code so my followers could get a discount and I could track where the sales came from. I got a few likes and retweets, but didn’t sell any books! So I decided to pay to have Facebook “promote” my post that highlighted the discount offer. Did it work? Well, instead of reaching 200 people, as my more popular posts do, I reached nearly 1,800. But only 3 people clicked on the purchase link and nobody bought a book. Fortunately, I didn’t spend much on this experiment. So should I ever advertise on Facebook again? Maybe, maybe not. I judge the success of a marketing campaign on my goal(s). Is it more hits on my website, press coverage, or just plain sales? When I set a goal for a marketing effort, I also decide how I’ll track and measure the results. Each tactic has lots of variables to control for. For example, there are many possible reasons why my Facebook post didn’t generate clicks or sales, such as the time I posted it or the text I posted. To get better results, I could try posting the same thing at different times of the day, or post different content at the same time of day. I can see exactly how many people viewed each post, clicked on my link, liked it and shared it. I can then track that information on a spreadsheet. I also enter which discount codes were used. This enables me to evaluate which variables generated the most response and sales. Was it a beautiful photo? Did I ask my followers an intriguing question? Was it the time of day? This analysis will give me a better idea of what to do if I advertise on Facebook again. Does Free Content Lead to Sales? When I re-launched my website, I added some business tools and templates designed to help food entrepreneurs save time and money. I spent a lot of time developing these tools and charge a modest fee for them. At first, I was hesitant to give any of my products away, but I figured that if I offered a free sample, they’d buy more. For example, I have beautiful recipe cards that farmers or farmers’ market managers can download, print and hand out to their customers. The cards provide useful information, but they also promote my website and cookbook. I emailed farmers market managers all over the country, offering the recipe cards for free for a limited time. 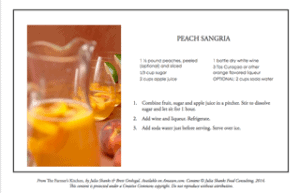 Over 100 people registered on my site to download my recipe cards. But what impact does that have on my business? After all, I didn’t generate any revenue from it. First, those 100 people printed out my recipes and distributed them to countless other people they know. Now, all those people know about my recipes, recipe cards and cookbook. Second, I have contact information for 100 people with a demonstrated interest in my products. I can add them to my mailing list and send them targeted emails. And I can continue to track the response. Did my promotion impact book sales? That’s hard to say, and that’s why marketing can feel squishy. I’m not a marketing expert, but I AM data-driven. And the more data you can garner about your marketing and other business ventures, the more informed decisions you can make to grow your business. P.S. from Myrna: Hope you enjoyed the guest post. By the way, are you trying to figure out what to do with all that zucchini? You need Julia Shanks’ cookbook, The Farmer’s Kitchen. It’s got lots of delicious, easy recipes–I use it all the time! Julia has generously offered to provide a discount for EGGS-pert Advice subscribers. Go to the site, add it to your cart, and enter discount code K59F65J3. Previous Previous post: Are You Millennial Enough?